Amazing North Sails seasonal offer! Don't miss out on this year's North Sails Seasonal offer. The deal is for orders placed for delivery before end November so please place your order today to avoid dissapointment. For information on our special deal email us atinfo@suntouched.co.uk or to talk through your requirement please call us on +44 (0) 7734 251033. We are always happy to advise on the best options and although our specialisation is the Finn class we also have experience in a range of other classes including Star, OK, Solo and Phantom. We regret that we are not able to extend this deal to either the D-One or D-Zero classes. 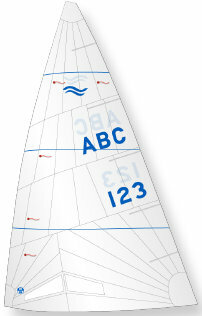 Click here for Finn sail models or call us for information and pricing on all other North od sails. Pictured right is Ed Wright celebrating his win in this year's Europeans sailing his Devoti D-Fantastica. The medal race was epic with winds gusting over 30 knots and huge seas. The on board video of Ed's medal race is worth watching, even if you've seen it before it's probably worth another look. You can find the video here Ed's Europeans Medal Race. The Devoti D-Fantastica is the choice of all of the World's best Finn sailors. It's no surprise to us, of course, that the Fantastica continues to show its pace in the Finn class major events across the world. The boat just seems to 'feel right' both to windward and downwind giving the edge that's so important in this close racing class according to Rodney Cobb. He goes on to say that his Fantastica is the best Finn he has ever owned (having owned about 30 or more Finns over the years) and is such a joy to sail. His take on the design it that it's going to be hard to improve on this innovative Finn and believes that it's so close to perfection that it will be the boat to beat way into the future. For more information go here or Email us, info@suntouched.co.uk or call us on +44 (0) 7734 251033 to discuss your requirement. Developed in conjuction with Jonathan Lobert, Olympic Bronze, London 2012, for maximum comfort in hot conditions. Having passed the D-Zero element of our business to Howwhatwhere Ltd, David Valentine, there's more time for sailing so the objective has been achieved. David's done a great job on the new D-Zero website, www.dzero.co.uk, which also includes online shopping for the owners. The Nationals this year were hosted by the Mount Batten Centre in Plymouth and attracted over 40 entries. For some great video of the Nationals check these three out Day 1, Day 2, Day 3. It's great for us to see the continued development of the D-Zero class and we are looking forward to visiting the D-Zero Inland Championships at Grafham Water Sailing Club, to be held 8th/9th September. We're hoping for a record entry but, sadly, there's a clash with Emsworth Slipper SC's regatta. Emsworth has the second largest D-Zero fleet in the UK so it's bound to have some effect on numbers but, having said that the class is now strong enough to support 2 events over the one weekend. Suntouched Sailboats is a small business, based in the UK in Hayling Island, specialising in, mainly, Finns, D-Ones, North od sails and Sandiline sailing clothing. We are proud to be dealers for Devoti, North and Sandiline who have incredible records when it comes to Olympic medals. Having been involved with Finns for over 45 years we know a thing or two about the class and are always keen to talk Finns so give us a call anytime! For up to 40% off Finn Rudders and Sandiline clothing go to the 'Clearance' button above! After months of design and development work we have now launched the new Needlespar MkIIS ('S' for stiff) Finn boom. We understand the need for a Finn boom to be superstiff and have focused on being able to offer the stiffest Finn boom on the market. Stiff Finn booms are essential for sail control when beating and providing full power on the offwind legs, especially when pumping. All of the machining and fitting out of these booms is done in house so we have full control when it comes to quality. Using, predominately, Harken fittings and a carbon vang lever these booms are without compromises.They are based on the original Needlespar Finn booms but with more control over consistancy of product characteristics to ensure that all ouput is of equally high specification. We can supply the booms as blank sections, machined and ready for fittings or fully fitted. As always most of the fittings are Harken and we offer options of stainless steel or rope hangers for mainsheet block and tie off. All outhaul lines are high quality Dyneema. Having extensively tested the new Needlespar MkIIS Finn booms Henry Wetherell and Ben Cornish, both pictured right, chose to use the booms at the Finn Gold Cup in Aarhus. Also available are the Suntouched Carbon vang levers with optional 13mm or 16.2mm holes for pivot pins. Yes, the New Needlespar MkIIS Finn boom has arrived! Ed's epic Finn Europeans 2018 medal race!